As I drove up to Midland this morning with my buddy from Ford-Germany, Dave Newton, I thought to myself there is a match in Malvern today, and Monday starts the Mid-West Palma, we'll probably have a half dozen shooters. I was wrong. We had sixteen. We ran four targets with four relays. After a short delay with starting due to poor WIFI from the targets to our base station we got started and things were moving along. One target failed, so we moved those shooters over to our hospital and continued the march. We seem to be learning more about radio frequency wave patterns than we really wanted to know, but we are learning more "best practices" with the Silver Mountain Targets. Peter Church continued his hot hand with a 596-26 besting Jake Bondy with a 595-28 in Any Rifle. In F-TR, John Roethlisberger continued his winning ways with a 597-31. Ray Gross was a close second with a 596-35. Our next match will be July 2, 2016 for the Independence Day Challenge. A 3x600. Come on up! 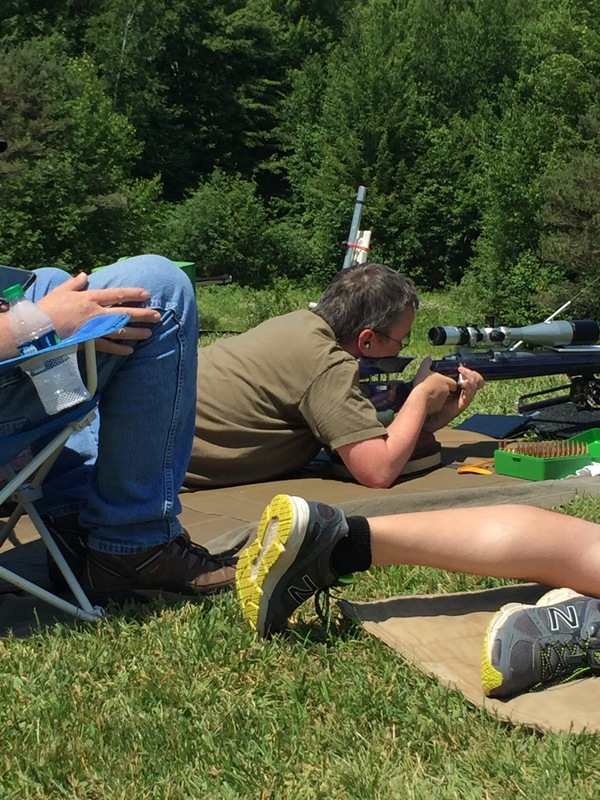 Our German visitor, Dave Newton firing F-TR with Al Walewski's Rifle.